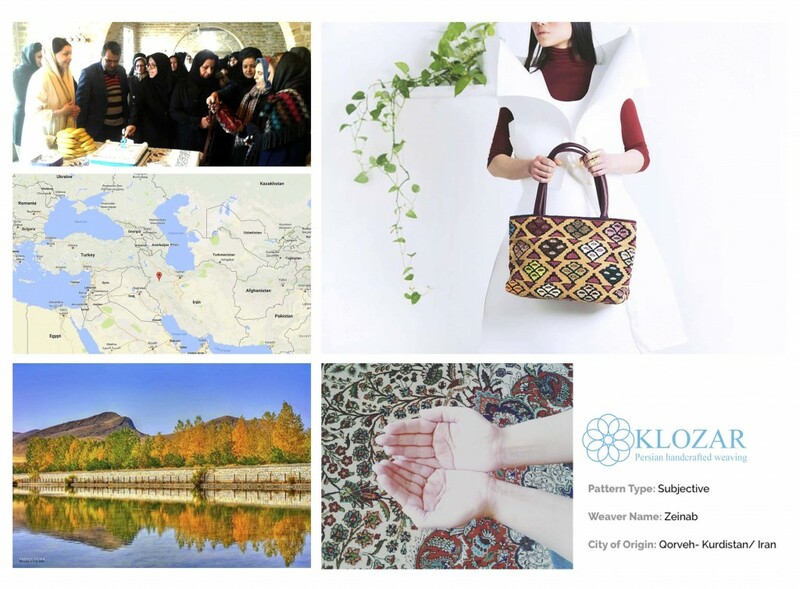 Klozar is an organization aimed at supporting women weavers residing in the rural areas of Iran, such as Kurdistan, Sanandaj, Bijar, Hashtgerd, Eslam shahr, Tehran, Nezam Abad. Through supply and distribution of high-quality crafts, Klozar creates a market for Iranian craftswomen whose art is at the edge of deterioration. The initiators hand picks the highest quality weaving, compensates the weavers twice the national average, and commission waivers before they start weaving. Women weavers produce bags whose labels identify who made them and where. The bag labels give the name of the traditional design that has been passed down through the weavers' families for many generations. Most of these patterns are passing to the next generation of waivers by a song that tells the weaver what pattern and colour they should use as they keep singing and weaving. Entrepreneurship and supporting women weavers in all over Iran in creating a safe space for them to use their talents. Support women to become independent financially. Collecting stories from women weavers who were always hidden behind the weaving industry. Bringing back the traditional colours and patterns that were going to disappear and repurpose the weaving for a more contemporary use introducing it to the next generation that will keep the handwoven industry alive. Allowing people to use the handmade weaving component in their daily life by getting introduced to different patterns, colours and the information of provenance and who are the weavers behind the woven product. Since the creation of Klozar more than 40 weavers joined the organization from more than 25 cities and villages around Iran. Klozar supported women in negotiating and changing mindsets of their husbands and families, who are not allowing them to be financially independent, because of the cultural and traditional expectations and barriers. The project supported weavers' families by providing healthcare - such as medicine that is not available, because of being expensive or rare, as a result of Iran's sanctions by 5+1 world power countries - and home supplies or children's school material. Klozar gives a platform to emerging artists in the fashion industry. It brought back the attention to handwoven industry that was fading by new machines and China's industry. The project has received many awards including the best cultural entrepreneur of Iran by cultural heritage of Tehran in 2015. Women Weavers, Local young and emerging artists in fashion industry, Supporters who use the weaving products and a culture in their daily life.